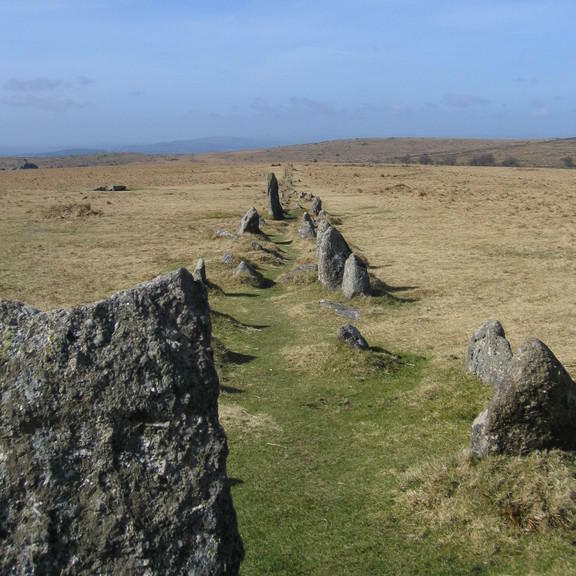 Just twelve miles north of Plymouth and three miles east of Tavistock lies a little gem just right for lovers of prehistoric sites. 4000-year old stone rows, a standing stone, a stone circle and several burial mounds make up a ritual complex, while the remains of numerous 3500-year-old huts sit quietly alongside. Around you is nothing but moorland. No fences, no barriers, no posters and - when we visited Merrivale - no other people. Nothing but the stones and you, free to go where you wish and look at what you please and take your time over it. I cannot imagine a better way to explore a prehistoric site. Maybe in the summer, when all of Devon gets busy, Merrivale will get busy too. But somehow, I doubt it because the signposting to this beautiful, extensive site is simply non- existent. 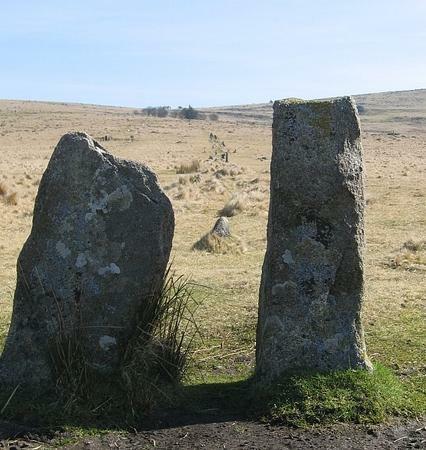 I suppose you might happen across the stones while walking on Dartmoor, pause for a time and wonder ... But if you want to come here specifically to see the stones, then I'd recommend you bring a map. 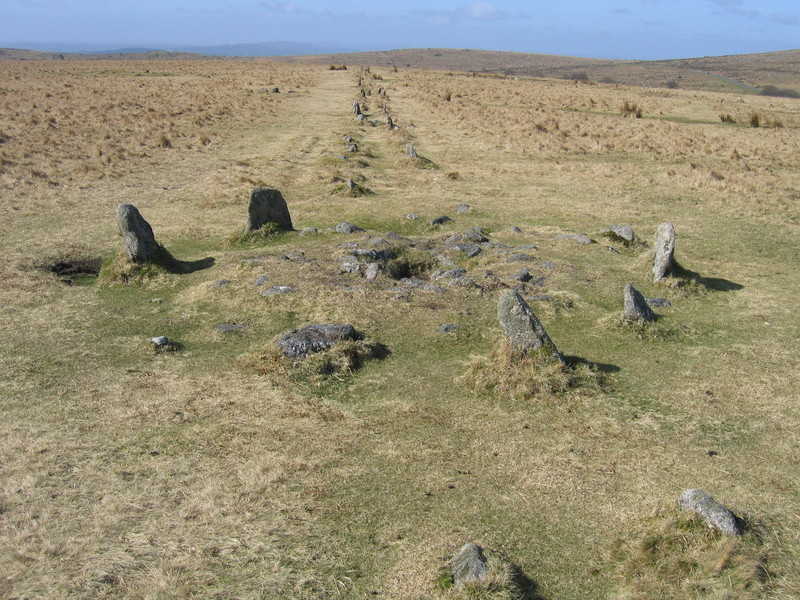 The site is on the B3357 between Tavistock and Pricetown, about a mile east of Merrivale. Coming from Merrivale: drive through the village and up the hill. To your right you'll see a car park that has trees growing at the back of it. Stop there. Coming from Princetown: when you see a quarry on the hillside in front of you, look for a car park with trees growing at the back of it on your left and stop there. (If you drive down the hill and into Merrivale, you've gone too far.) The car park is easy to spot, as the trees stand out in the otherwise bare landscape. You cannot see the site from the car park but you don't have far to go. Walk down the right-hand side of the car park for about 200 metres towards a marker stone, which you can see from the top. When you reach that, turn right and spot the next stone. Walk towards that. You can see a third stone before you, still bearing slightly to the right. The Merrivale site has two distinct double stone rows running east-west and when you reach this last marker stone, the first stone row is right in front of you. You can see the second one to your right, a little more towards the road. Both stone rows start with a large, flat stone and then develop into two roughly parallel lines of stones with a small gap between them. And as you stand and look at them, the two rows seem to be converging slightly on some now unmarked point somewhere behind you. About half-way down the left-hand stone row, there's a burial mound. 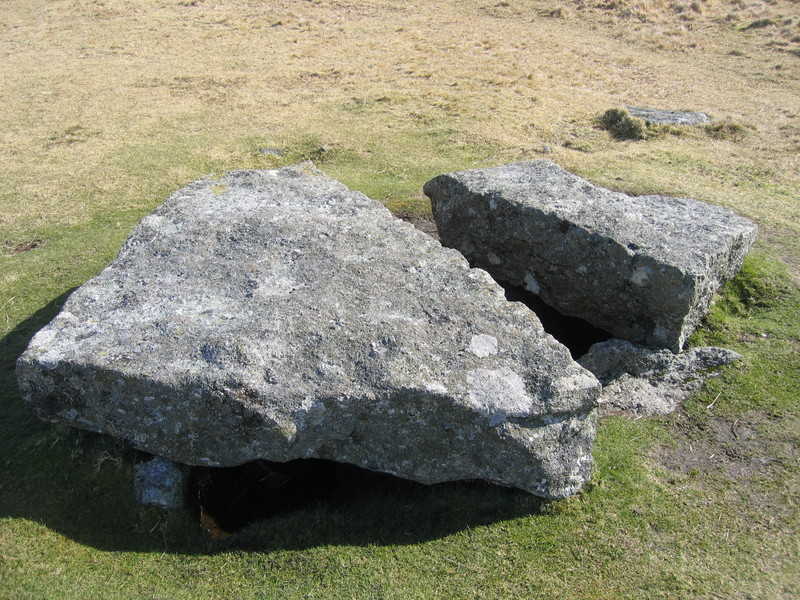 And a little to the left you can find a cist (or kist), a rectangular pit lined with granite slabs. This is covered by a large piece of granite, that was subsequently cut to provide a lintel stone for someone's doorway. A short way beyond the end of the two stone rows you can find the remains of a stone circle. It covers quite a bit of ground but only 11 small stones remain now and we have no idea what the circle may have looked like while in use. On the far side, the stone circle appears to have an entrance guarded by a 10-feet tall standing stone. Only a couple of paces away, lie broken stones by a depression in the ground. Could there have been two stones guarding the entrance to the circle? Since symmetry always seems to play a large part in prehistoric ceremonial sites I like to think so. Compared to other prehistoric sites - like Stonehenge or Avebury - Merrivale is deeply peaceful. Alone amongst the stones you can allow your mind to stray back into time and wonder about the site. The complex occupies a ridge, but it is not the highest point in the landscape. Neither is the only available level ground. Were the stone circle and stone rows built and used at the same time, or do they reflect changing beliefs or methods of worship? Does worship even come into it? I'm afraid I have none of the answers. The stone circles you find all over England may indeed keep their secrets forever, but some small part of me hopes that one day - all will be revealed. 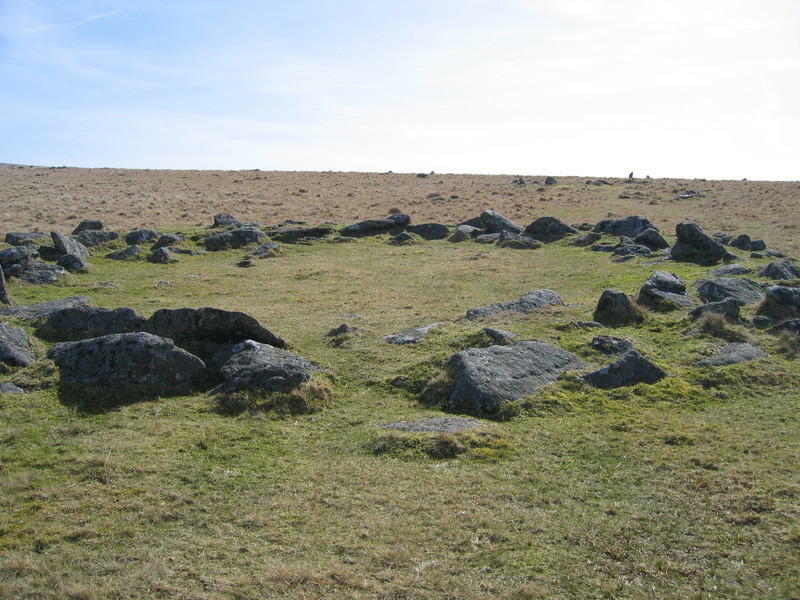 Not content with stone rows and circles, the Merrivale site also boasts the remains of a prehistoric settlement, which is thought to be about 3500 years old. Walk from the stone circle past the stone rows towards the road and you'll soon come across the remains of stone-built round houses. Nothing but the collapsed walls are left, but as each one appears different in size (and sometimes shape), you can picture a busy community at work alongside the monuments. The modern B3357 runs right through the Bronze Age village and you can find hut foundations on either side of the road. The village is built on sloping ground facing towards the standing stones. So were these the people who built the monuments? Probably not. 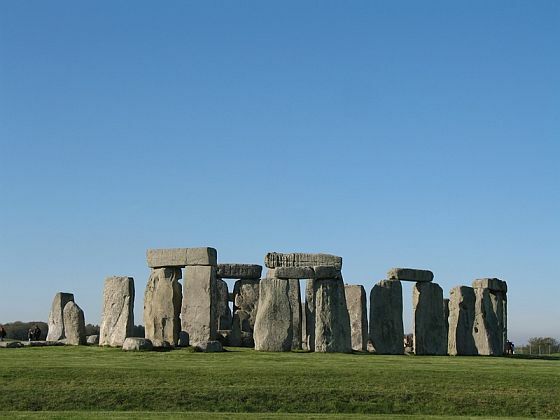 Based on dating evidence, the stones were already standing when the village was built. But the inhabitants could have been 'servicing' the ceremonial centre. As villages grew up around medieval pilgrim sites to house and feed visitors, maybe so this village grew to accommodate those coming to the stones. Unless an archaeological excavation of an undisturbed site can shed light on the matter, we simply won't know. So should you visit Merrivale? If prehistoric sites interest you I believe you should. Stone rows, stone circles, standing stones, numerous burials and a Bronze Age settlement make for an inviting mix of features, all waiting to be explored. And the peace of the site - away from hype and traffic - lets you sit and soak up the atmosphere and maybe wonder a little about the people who raised all these stones 4000 years ago. 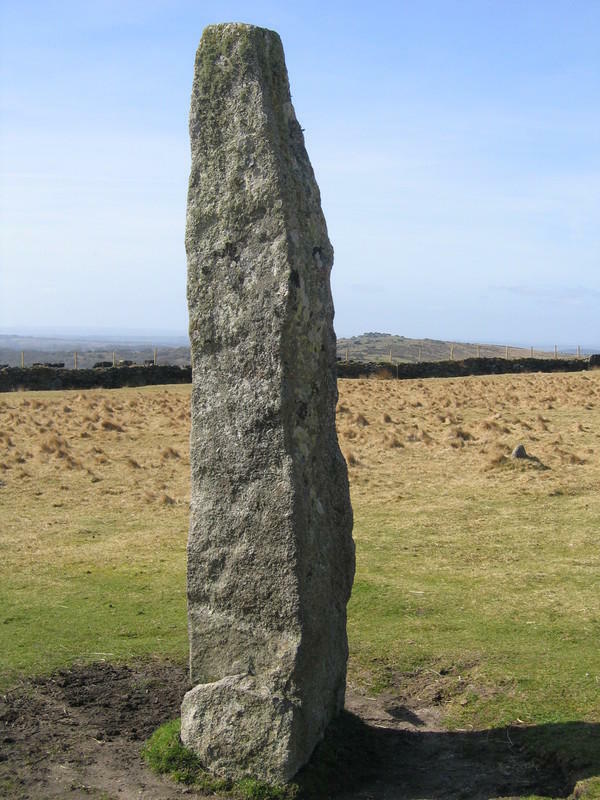 To explore more of England's prehistoric sites, return from Merrivale to the Prehistoric England page. Or continue to the Devon page to explore more of this fascinating county.